Mamaearth Feel Better Tea ( To Improve Immunity & Digestion ) Review..
Green tea or herbal tea is good for health but not for taste.. I am not sure, if you are agree with me or not but that's what I feel whenever I think these teas... I am not a tea addicted but I drink rich cream milk tea with ginger whenever feel low or during cold cough time . Last month when I was contacted by the brand Mamaearth to try out their newly launched women wellness products I choose this 'Feel Better Tea' . By seeing the ingredients I had high expectations.. 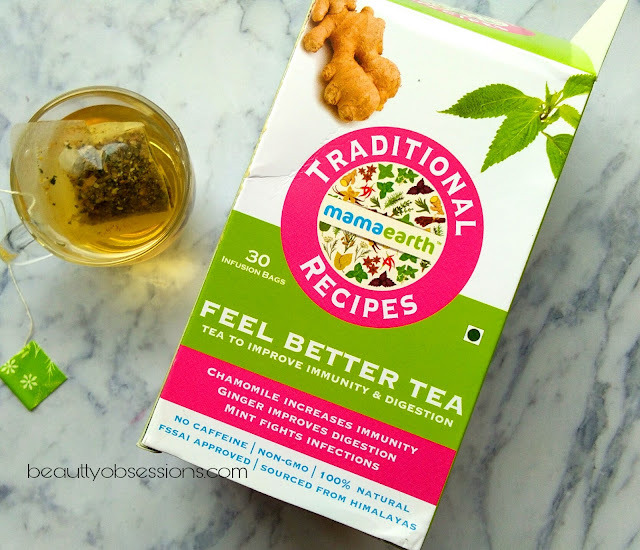 I am having this since more than one week now and it is about to finish.. Let's see my experience with this herbal tea by Mamaearth.. Brand's Voice - Becoming a mom is no cake walk, acidity and low immunity can make it even more difficult. There are days when you just want to feel better. Well, the feel better tea is for you.. Grab a cup of this tea and this will protect you from all the infections while strengthening your immune system . It also helps to settle the stomach, aid in digestion and revive you for the day. A handcrafted blend of mint, ginger, chamomile and other soothening herbs. It calms those unwanted stomach issues while making you stronger inside. Shelf life - 1.5years from mfg. Ingredients - Fennel Seeds, Nettle Leaf, Chamomile Flower, Mint Leaf, Ginger Root, Fenugreek Seeds. Nettle Leaf - Nettle is a strong antioxidant, purifies blood and cures upset stomach. It also helps with skin issues like acne, eczema, etc..
Chamomile - It calms the nervous system, builds immunity and aids in digestion. It also helps you sleep better by relaxing your mind. Mint - It boosts immune system, especially against common cough and cold. It also helps in reducing menstrual cramps. Ginger - It aids in digestion, reduce nausea, helps manage imbalances in the guy and builds immunity. 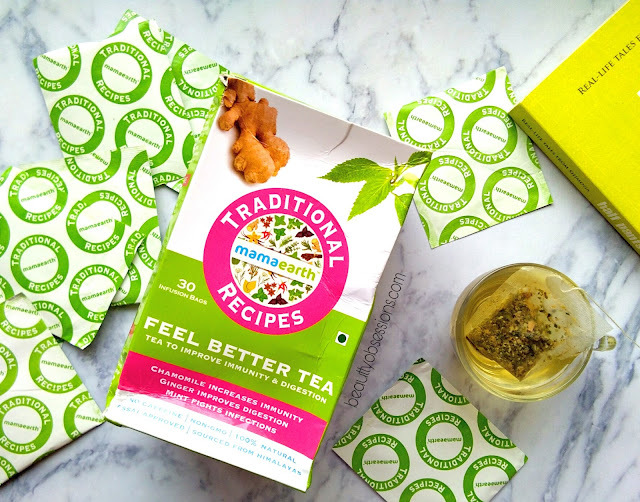 My Opinion - This feel better tea comes inside a cardboard box.. 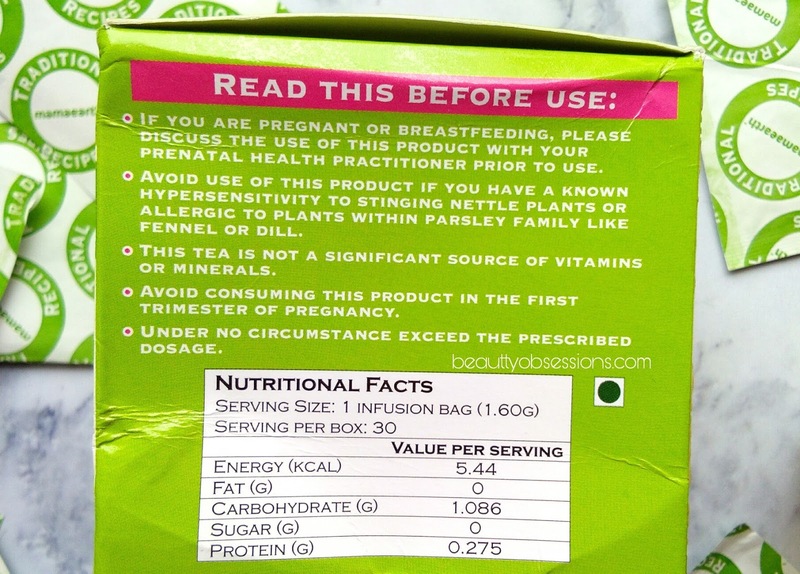 There are 30 sachets in one box.. All information regarding the product are on the cardboard box itself... 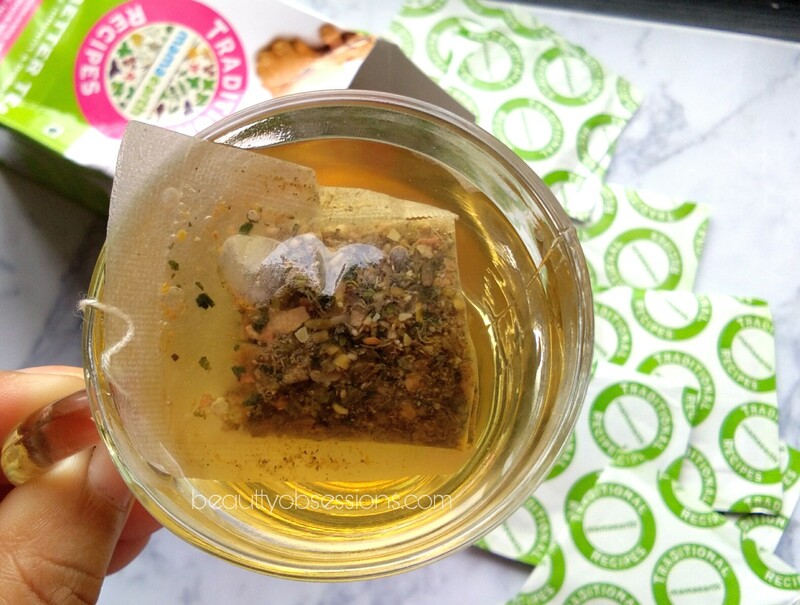 Overall the packaging is like normal green tea packaging, nothing special in it..
To get the maximum/proper benefit of this herbal tea, you have to prepare it in the right way.. For preparing, pour 200ml. freshly boiled water in a ceramic cup and deep a tea bag into it and cover with a lid for 10-15 minutes. I too add a pinch of cardamom powder to enhance the flavour. Then gently squeeze the tea bag to release the remaining extract and your herbal tea is ready to have.. It is advisable to drink 2 cups daily in between meals. After my delivery, acidity has become my friend... Sometimes due to acidity, I feel low and constipation is another issue because of acidity only... These days I am having this tea twice a day (once in the morning after having breakfast and once in the afternoon) everyday.. And it has been more than a week now I have no acidity and no other stomach issue... 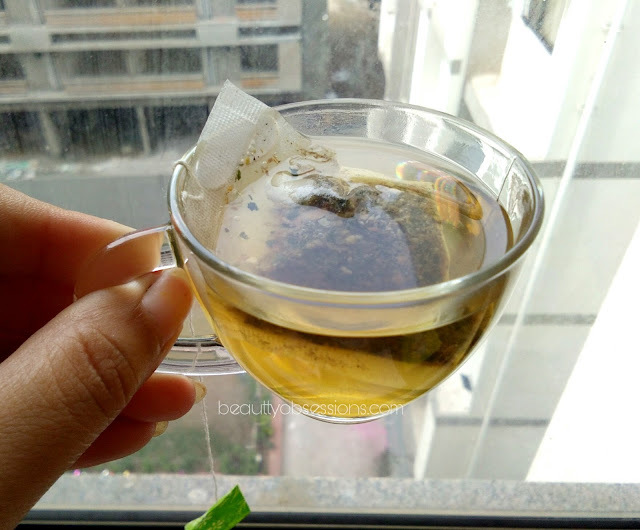 I feel really better (like its name says) after adding this tea into my diet routine..
Hope you find this review helpful... Share your thought in comments below..
See you in the next post.. Till then stay beautiful..
* Sponsored post but my opinion is always honest and unbiased. Very true... Agree to your words.. This must be very good..
Green tea lovers will love it for sure.. Yes.. You have heard right... This is an awesome brand.. I loved this tea but the price is definitely a barrier for me too. The ingredients itself make me feel like trying it out rightaway. Have to try this out. Thanks for sharing. Great to know that this Tea has reduced your acidity issues after becoming Mom, shall try out very soon. Yes yes, it is really effective on that issue... Do try.. Impressed with the ingredients. Will try this out very soon. Mamaearth products are my favourite ones. This feel better tea seems must for me. Really gonna try this one. 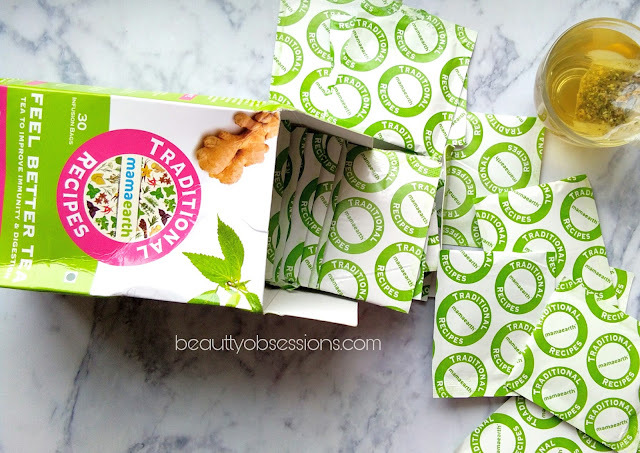 I love mamaearth products now would love to try tea too. Thank you... Glad you find the post helpful.. I liked these concept teas but the price is on a higher side. Yes the price is on higher side but it is so effective..
Sure Anita ji... You are welcome..